Be the first to share your favorite memory, photo or story of Earnest "Ernie". This memorial page is dedicated for family, friends and future generations to celebrate the life of their loved one. Earnest Junior Smith was born on November 24, 1931 to Alfred Leonard and Nannie Mae (Rogers) Smith in Bristow, Oklahoma. 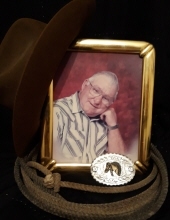 He departed this life on March 26, 2019 at his home in Pryor surrounded by his loving family. Earnest has been a resident of Mayes County since 1964. He was a member of the Teamsters Union. He was a team roper all over the state and past president of the 4-Way Rodeo. He also managed a band called Ernie’s Good Time Brigade. Earnest drove a truck for seventeen years and also owned Lazy Dayz Worm Farm for eleven years. When he retired, he started a lawn business and also enjoyed eating and visiting at the Eastside Café. He and Phyllis also enjoyed spending time with Ryan. Earnest was a wonderful father and grandfather and a friend to many. He will be deeply missed by all who loved him. He is survived by his children, Rick Smith and wife Linda, Melvin Smith and wife Lois, Loretta Young and husband Larry, Jeannie Owens and husband James and Karen Hamill and husband Bobby; eighteen grandchildren; four brothers, William Smith and wife Cleo, Cliff Smith and wife Fern, Robert Smith, Harvey Smith and wife Virginia; one sister, Alene Brown and husband Bill and several nieces, nephews, other relatives and friends. He is preceded in death by his parents, Alfred and Mae Smith; three wives, Rosetta Smith, Dorothy Smith and Phyllis Smith; one daughter, Elizabeth Smith Gilbert; three brothers Sonny Smith, Dean Smith and Virgle Smith and three sisters, Ruby Smith, Jessie Landers and Jewel Peeper. To send flowers or a remembrance gift to the family of Earnest "Ernie" Smith, please visit our Tribute Store. "Email Address" would like to share the life celebration of Earnest "Ernie" Smith. Click on the "link" to go to share a favorite memory or leave a condolence message for the family.